Columbus Day Memorial Mass at Holy Rosary Church | Ciao Washington! 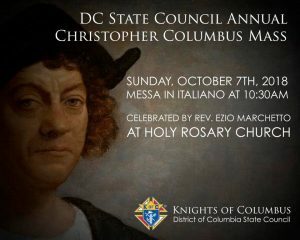 The DC State Council Annual Christopher Columbus Mass will be held on Sunday, October 7th, 2018 at Holy Rosary Church, 595 (3rd St NW, Washington, DC 20001) at 10:30am with Fr. Ezio Marchetto celebrating Mass in Italian. There will also be a parish procession before Mass beginning at 10:00 am. Refreshments and brief program will follow Mass next door at Casa Italiana Language School. All Knights and their families are welcomed to attend.